(Nanowerk News) Carbon nanotubes used in the electronics for such devices as cell phones might have a longer life thanks to a strengthening technique pioneered by researchers at the Lawrence Livermore National Laboratory (LLNL), Boston College and Massachusetts Institute of Technology (MIT). A single-walled carbon nanotube heated to more than 3,600 degrees Fahrenheit became nearly 280 percent stronger than it was in its original form, and its diameter shrunk by 15 times. The discovery has implications in strengthening ceramic and other nanocomposites at high temperatures and is useful in tuning electronics. 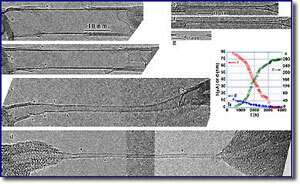 “The super-strain we discovered can be used to tune the electronic properties of carbon nanotubes for their applications in microelectronics,” said Yinmin (Morris) Wang of LLNL’s Materials Science and Technology Division and a co-author of the paper that appears in the Jan. 19, 2006 edition of the journal Nature. Wang also is an important member of the recently established Nanoscale Synthesis and Characterization Laboratory in the Lab’s Chemistry and Materials Science Directorate. Carbon nanotubes are 10,000 times smaller than a human hair and are used in a variety of machines including computers, cell phones and personal handheld devices. A typical carbon nanotube can be stretched to 15 percent longer than its original length before it fails. But in the high-temperature experiments, the heated nanotube was able to stretch to more than 280 percent of its original length before it broke. The researchers took a 24-nanometer piece of nanotube and stretched it to 91 nanometers before it failed, while the diameter was reduced by 15 times from 12 to 0.8 nanometers. “This kind of intense stretching and reduction in diameter in a carbon nanotube is unprecedented,” Wang said. “This super-elongation is due to a full plastic deformation that occurs at high temperatures.” Under such high temperatures, the nanotube appears to be completely pliable, resulting in a superplastic deformation that would otherwise be impossible at low temperatures. In addition to Wang, co-authors of the paper include J.Y. Huang and S. Chen of Boston College and M.S. Dresselhaus of MIT.